The kitchen is one of the most commonly upgraded rooms in the home. And sooner or later you to complete an extensive renovation, but even if you don’t have the budget or desire to do that, you still might be interested in a new range hood installation. Modern range hoods are having a huge difference from traditional microwave fans. If you’re ready to install a beautiful and extravagant range hood in your kitchen, consider these buying tips to help you make a successful upgrade. First, decide whether you want your new range hood to add an impressive aesthetic to your kitchen or simply provide ventilation without drawing much attention to itself. Island and wall-mounted range hoods typically have the most eye-catching designs that guests are sure to notice right away. Under-cabinet models can be striking as well, or you can opt for a design that isn’t as obvious. The most basic range hoods only cost about $100 before installation, while elaborate versions can have price tags in the thousands. The most significant factors affecting the cost include size, power, and features. Ducted ranges also cost more to install than duct-free versions. Lights: Most range hoods come with this basic feature to ensure adequate lighting over the cooking surface. Heat sensors: These automatically turn on the vent when they detect a high-level of heat. Automatic shutoff: To save energy, some range hoods automatically shut off after a certain amount of time in use. Filter indicator light: This notification tells you when it’s time to replace the grease filter. Multiple fan speeds: With high, medium, and low fan settings, you can balance ventilation and noise level. What type of ventilation does the range hood use? 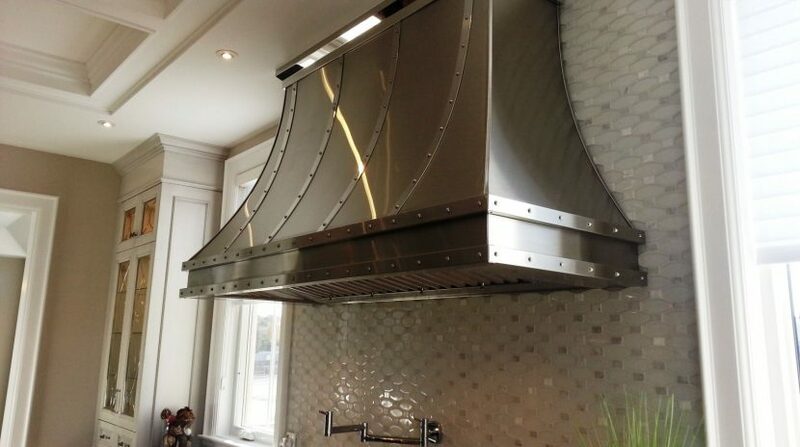 Range hoods are either designed to vent exhaust outside or remove as much smoke and grease particles as possible before recirculating the air back into the kitchen. Ducted range hoods are far more effective at removing smoke and contaminants, cooling a hot kitchen, and reducing the chance of carbon monoxide exposure than duct-free versions. How powerful is the range hood? The more air the fan moves, the more effective it is. New range hoods should feature a label with air movement ratings in CFMs, or cubic feet per minute. For wall-mounted and under-cabinet range hoods, look for at least 100 CFM for each foot the range is wide, and 150 CFM for island range hoods. If the new vent has a stronger fan than the old model, the vent may require relocation or a new vent pipe. Is there an existing vent for the exhaust? If you’re replacing an existing ducted range hood, it’s obvious you should choose the same style to make use of the existing ductwork and vent. Even if you’re upgrading from a duct-free version, the more complicated installation may be worth it. Will the hood work with your cabinets and cooktop? In most cases, the surface area of your cooktop should directly correlate to the size of your new range hood. Under-cabinet and wall-mounted hoods also need to fit in the space you have available between the overhead cabinets. A kitchen remodeler can help make any necessary changes to your cabinets to fit the range hood you want. While some types of range hoods can be installed without difficulty, you’ll benefit from professional assistance if you have a more complicated installation on your hands. As previously mentioned, ducted ranges are far more effective than duct-free versions, so even though they require professional installation, their superior performance makes your kitchen upgrade more worthwhile. For help performing range hood installation or other kitchen renovation projects, please request service from the Pro Handymen near you or call 619-497-9775 today. We offer help for homes and businesses.